By now, many of you will have already started your Labor Day weekend. Plenty of folks will have plans for the weekend, but I wonder how many of us will be thinking about the meaning of Labor Day? Very few, I suspect--even the workforce management or procurement professionals among us. I’m not trying to guilt anyone here. I’m just asking the question: Should we be thinking about it? In other words: Don’t think about it. Just retreat into your atomized private existence and get some R&R before you go back to the weekly rat race. For me, at least, that’s a deeply unsatisfying, perhaps defeatist, answer. But before sharing my own thoughts on the question of what to do instead, a bit of context might be helpful. Labor Day began not as a national holiday but in the streets, when, on September 5, 1882, thousands of bricklayers, printers, blacksmiths, railroad men, cigar makers and others took a day off and marched in New York City. “Eight Hours for Work, Eight Hours for Rest, Eight Hours for What We Will” read one sign. “Labor creates all wealth,” read another. A placard in the following year’s parade read, “We must Crush the Monopolies Lest they Crush Us.” The movement for the holiday grew city by city and eventually the state and federal authorities made it official. The national holiday emerged 12 years later in the face of a federal crackdown on labor. In 1894, at the behest of railroad companies and industrialists, President Grover Cleveland deployed more than 10,000 U.S. Army troops to break the Pullman strike in Chicago — the first truly nationwide strike, which involved more than 150,000 workers from coast to coast. Protesters were jailed, injured and killed. Amid the turmoil that summer, and as an olive branch, Cleveland signed legislation to make Labor Day a national holiday. Obviously, a lot has changed since then. Labor force data was scarce into the early 20th century, but we were able to piece some data together from 1910. 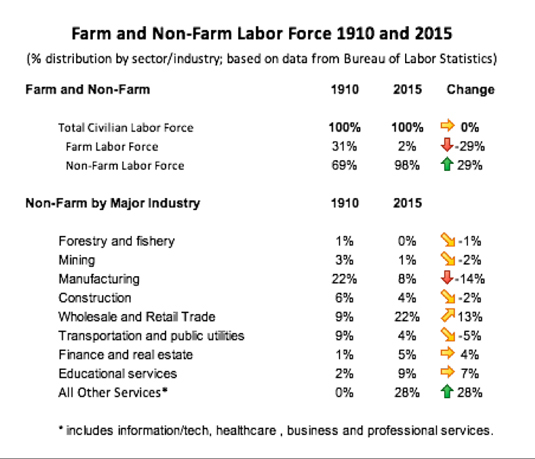 As the total number of farm and non-farm workers increased from 37 million in 1910 to 148 million in 2015, the sector and industry composition of the labor force changed significantly. While most of these changes are not news to most of us, it is startling to look at the numbers over a time frame encompassing an agricultural economy, an industrial economy and a services/information/knowledge work economy. It would be pointless to try to give an adequate account of all the changes that have occurred over that epochal time period. So much has changed; some say even the nature of work itself has. And it has, insofar as the vast majority of the labor force is engaged in knowledge work, or at least in work that does not involve significant manual labor. But at the same time, many things — those essential to labor (e.g., time and effort, adding value) or those “man-made” (e.g., work arrangements, unions, discriminatory practices) — have not changed or not changed enough. Today, quaint as the ancient word may sound, labor (a noun and a verb) still refers to a human's application of his or her own time, energy, physical or mental capabilities to create an outcome of value to someone else (whether it is compensated or not). While terms like "human capital," "contingent workforce," "gig economy" and the "future of work" represent the perspective of the buyer/consumer of labor services, "labor" also represents the perspective and experience of the seller/provider of labor services. Forms of labor and different ways that organize how it is perfomed have changed in significant ways, but the essence of labor is the same. Have we forgotten the true meaning of Labor Day? Is Labor Day a confused holiday with no associated rituals? The answer to both of these questions is, unequivocally, “Yes.” But does that mean we should just go with the flow — shop, eat, drink, be happy and forget--each in our own little, private way--at least until the day after Labor Day comes? It is true that circumstances — both economic and social — are very different from what they were almost 140 years ago, when Labor Day was first celebrated. But labor is essentially the same: the application of one's time, energy, physical or mental capabilities to create an outcome of value to someone. Labor continues to build infrastructure, develop software, cure patients, repair cars, manage supply chain processes, keep our environment clean and tidy, send humans into space, give us a ride across town when we need it, create a modest to massive amount of wealth and so forth — the list goes on and on, because there are always new forms of labor that in turn create new value. Are we right to forget the meaning of Labor Day, because it really has no meaning today? Or should we reinvent the meaning of Labor Day to make it into something relevant for us today? If you think about it, it--or its celebration--has already been reinvented for us in a relevant, but rather perverse, way by the buyers of our labor? I would say we don’t need to forget or reinvent the meaning of Labor Day, because the core meaning is the same: the humanizing recognition of labor and the affirmation of all the people who labor an enormous part of their lives to create value that others and, hopefully, they themselves enjoy. And “all the people” is pretty much everyone — to labor is a major part of being human and a member of society. But labor is not only about economic value provided or captured. Studs Terkel, the author of Working, put it so well: Labor “is about a search for daily meaning as well as daily bread, for recognition as well as cash, for astonishment rather than torpor; in short, for a sort of life rather than a Monday through Friday sort of dying.” For any of us who perform labor that actually satisfies us at more than one Maslovian level, we should remember that many of our fellow human laborers have a more difficult time performing the work that needs to be done and that typically benefits us all (even if our share is 0.00000001% of a cent). One does not have to be a Marxist to acknowledge that labor is a collective enterprise, and that is true even for the most highly paid, recognized and nearly impossible to substitute individual contributor. The reality is that even that solitary human being is a contributor to the complex, interconnected, interactive process of creating the aggregate value of an economy’s output (whether the creation or distribution of that value is guided by an invisible hand or not). Moreover, the economic value, reputation, status and meaning attached to that individual is conferred upon him or her by the economic and social ecosystem. That’s just how it is — it doesn’t mean we have to have a collectively owned, centrally planned economy. Quite the contrary. It just means we should recognize it. I don’t think we have to reinvent the core meaning of Labor Day. We just have to recover it from one of the boxes of things we don’t need that we have stacked in the garage decades ago. However, we desperately need to reinvent the celebration of Labor Day for our own good and for the sake of our own humanity. We need to appreciate and respect the contributions of all who labor in ever-changing and uncountable numbers of ways to the produce the valuable outcomes which we enjoy, directly or even in some infinitesimally small indirect way. I entered the labor force in the 1970s, at age 16, first as a fast-food worker and later as a pharmacy delivery driver. (I was even confronted by a psychotic customer wielding a machete who thought I was Richard Nixon — apparently the delivery was late.) At that time, there seemed to be a pervasive ethic in the air that all labor was dignified and important and that anyone who labored was worthy of the same respect as any other. Things have definitely changed, and not for the good, in my opinion. Not only has the meaning of Labor Day been forgotten. The meaning of labor as a fundamental element of our collective humanity has also been forgotten. Maybe this weekend we can hold that thought in our minds for at least a few minutes and start to give it some serious consideration. In such divisive times as ours, perhaps Labor Day can become an occasion to recognize, revere and celebrate a common denominator that holds us together in perhaps the most important way possible. If the Gig Is Up, What Really is the Future of Work?